New data about the OTT (over-the-top) video marketplace highlights Netflix’s dominance, but also signals the emergence of a group of emerging media brands that the U.S. marketplace likely has not seen since the initial multichannel TV explosion that occurred with cable and satellite TV penetration in the early 1980s. 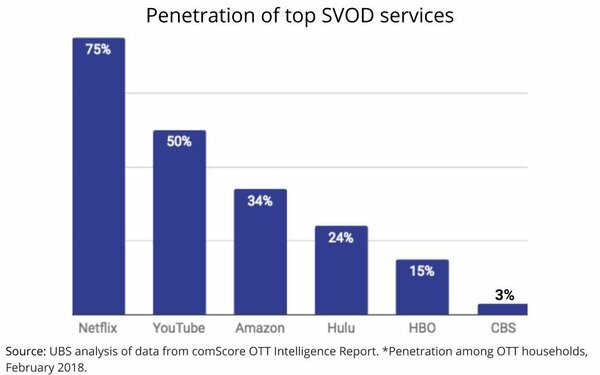 The analysis of data from comScore’s new OTT Intelligence Report, published early this morning by securities firm UBS, shows Netflix has a 75% penetration of U.S. OTT households, followed by YouTube (50% penetration), Amazon Video (34%), Hulu (24%), HBO Now/Go (15%) and CBS All Access (3%) services. The implications for fragmentation of audiences should be obvious to any media planner or buyer, especially when looked at in terms of the number of hours spent consuming the services each month by subscribers of those services. According to UBS’ analysis of the comScore data, the Big 3 -- Netflix, Hulu and Amazon -- are currently averaging somewhere between 13 hours and 25 hours of monthly viewing, per household. 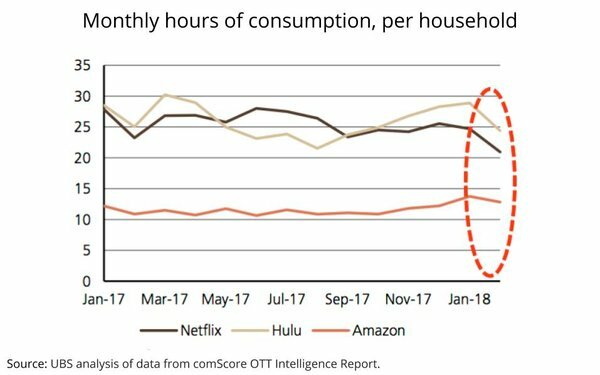 The marginal decline in consumption in February (see circled area below) was due primarily to a counter-programming phenomenon available on conventional linear television -- the 2018 Winter Olympic Games.